The English National Ballet hosts family-friendly performances which welcomes children under 5 year's old. I took my 2-year-old daughter to see The Nutcracker as part of the English National Ballet Christmas season. The English National Ballet has performed The Nutcracker as part of its Christmas season every year since 1950. The English National Ballet offers a family friendly performance for each ballet performed during the Christmas season. Family friendly performances take place on a weekday afternoon. A free buggy park is available and there are plenty of staff members on hand to assist young families. 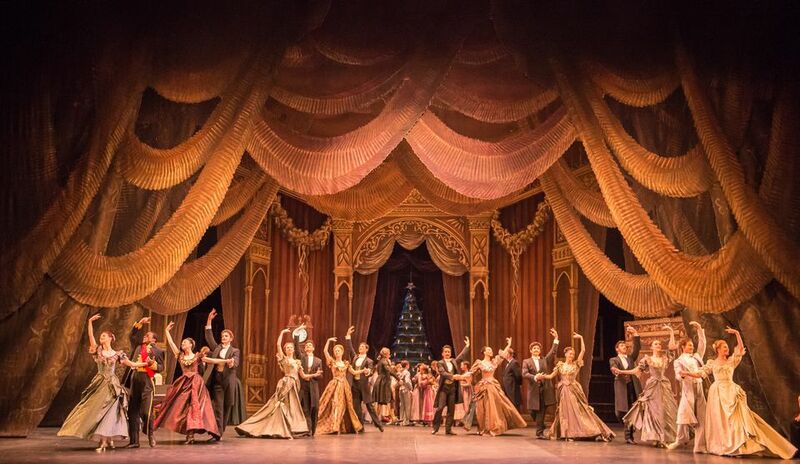 Each ballet is a different length but The Nutcracker is well-suited to young families as it lasts for about 2 hours with a 25-minute interval (fairly short for a ballet performance). The English National Ballet puts on a very colorful version of the E.T.A. Hoffman story which makes it great for the kids. When I saw the show the sets and costumes were by Gerald Scarfe and the choreography was by Christopher Hampson. This eccentric retelling of the classic Christmas ballet included snowflakes dancing out of a giant refrigerator, a sword fight between evil mice in the dead of night, and an origami bird to whisk the heroine, Clara, away to the Kingdom of the Sweets. The family sitting next to me and my daughter told me they come every year for this performance and I could see from the fact that nearly every seat was taken that it was an extremely popular event. The Grandma the other side of me told me I would be amazed how quiet the children were during the ballet and she was right, it was extraordinary. For the first Act, I think all the children were captivated by the fun antics on stage. I'd told my daughter the basic story: Christmas house party, Clara gets a nutcracker doll, brother breaks it, Drosselmeyer mends it, kids go to bed, Clara gets up, the doll comes to life, fights with mice, Nutcracker is hurt, Clara kisses him, all good. To the Land of Snow with lots of snowflakes dancing out of a giant fridge. You know, the usual stuff. My daughter sat on my lap for Act I and talked me through what she saw on stage. Even without words, it seemed all the children were very capable of following the story. And even at two years old, my daughter was totally captivated by the performance, especially during the house party as she (and I) loved the family characters. Act II involves the Sugar Plum Fairy and her Prince, plus entertainment from lots of characters in the Kingdom of the Sweets before the Grand Finale. My daughter wasn't so keen to sit still during this Act but she wanted to dance like the Sugar Plum Fairy and spent most of the second Act spinning around in front of her chair. The only downside was the end when my daughter was most upset it had to finish. She was having far too much fun! Once you have booked your tickets for an English National Ballet family friendly performance then why not enjoy the whole day in central London? You could spend the morning exploring the National Gallery following a family trail or using an audio guide. I would also recommend using the ArtStart touch screen system to plan your own tour. There are plenty of themed suggestions to focus on such as monsters and exotic animals. Lunch could be at the National Dining Rooms at the National Gallery or across the road in the Cafe in the Crypt at St. Martin-in-the-Fields. Both venues welcome families. After lunch, arrive at the London Coliseum by 2 pm for a 2.30 pm performance. It can get a bit busy with young families arriving so it's best to give yourself plenty of time. Enjoy the ballet performance and afterwards go to Trafalgar Square to see the Christmas tree lit up and listen to the carol singers. You could stay for dinner at Gaby's Deli or head home and collapse. It's been a long day! As is common in the travel industry, the writer was provided with complimentary services for review purposes. While it has not influenced this review, Dot Dash believes in full disclosure of all potential conflicts of interest. For more information, see our Ethics Policy. Why Not Learn to Cook in London?